Contact our full time Groomer Tricia Parker at (662) 816-5080 to learn more about our dog grooming services. Pricing is based on dog weight and length of pups hair. Pricing based on dogs weight and length of hair. Shampoo/conditioner and towel dry. This is an add on service for dogs at Camp for the Day or a boarding stay. This is not a stand alone service. For Grooming only/Bath Only needs, please connect with our full service Groomer. Add on a nail trim while your pup is at Camp for Day Care or during a boarding stay. Not available as a walk-in service. Add on a nail grind while your pup is at Camp for Day Care or during a boarding stay. Not available as a walk-in service. 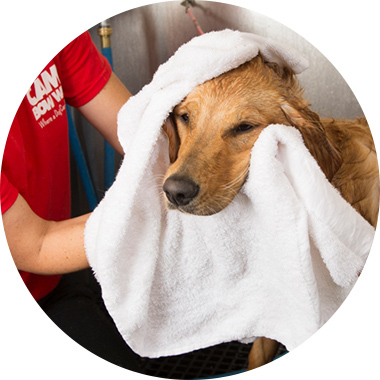 Add on an Ear Cleaning while your pup is at Camp for Day Care or during a boarding stay. Not available as a walk-in service. Add on a Teeth Brushing while your pup is at Camp for Day Care or during a boarding stay. Not available as a walk-in service.